Looking for the best pancakes in Sydney? You’ve found them. Only, there’s a catch. They’re actually crepes – the French kind of pancake (and the best kind). Confused about the differences between pancakes and crepes? Read on and we’ll set the record straight. If you’re wondering what the real difference is between a pancake and a crepe, you’re not the only one. 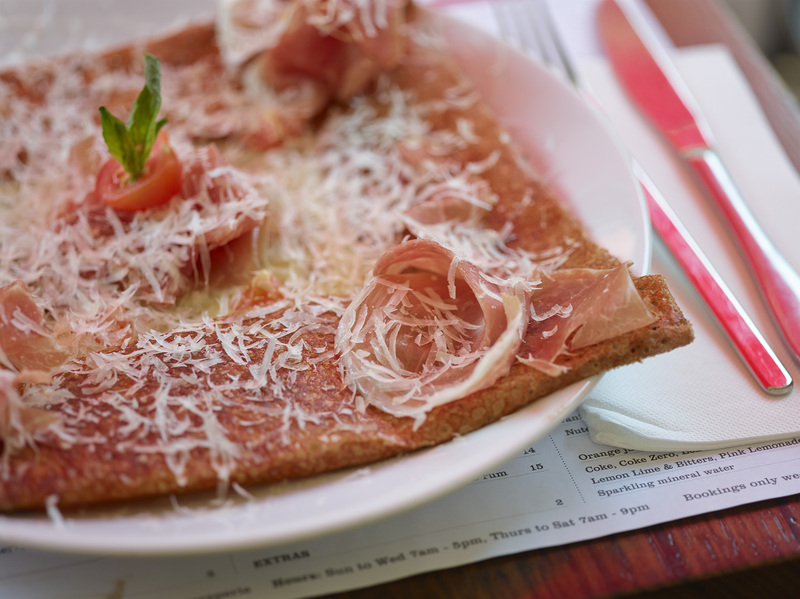 People who visit Four Frogs Creperie’s Sydney restaurants in Randwick and Mosman come in search of the “best pancakes in Sydney” pretty regularly. And when we politely point out pancakes and crepes are different, we’re often met with a raised eyebrow. Here’s the thing: not only do we insist that crepes are different, but we also believe that they are way cooler than pancakes, and it isn’t just because we are proud Frenchies. Crepe isn’t merely the French word for pancake. It’s also it’s own breed of pancake: classy, versatile and delicate, with a unique set of characteristics, and a completely different appearance. It’s a little bit like comparing the French actors Gerard Depardieu and Olivier Martinez: both are popular in their own right, one is a bit more famous than the other, but you know who you’d rather have on the other end of your fork. The obvious point of difference between a crepe and a pancake is thickness: crepes are paper thin and crispy, while pancakes are fluffy and raised. In fact, pancakes often contain raising agents like baking soda, while the secret to a perfect crepe recipe is its simplicity and lack of key ingredients. The crepe isn’t set in its ways like the pancake is. The crepe can be eaten at any time of the day – breakfast, lunch and dinner. It can also be rolled and folded, with fillings on the inside and out, while the pancake only really allows for sweet toppings (bo-ring). When it comes to crepes, the sky’s the limit. They can be either sweet or savoury. They can have a savoury base with sweet toppings. They can have a sweet base with savoury toppings. Unfortunately, the pancake simply can’t stack up. Would you like to eat a thick, fluffy American-style pancake topped with duck confit and caramelised onion? Didn’t think so. Look, we’re not going to try and convince you that our double chocolate crepe with whipped cream and almonds is healthy. Our savoury crepes (galettes), on the other hand, have proven health benefits. Buckwheat is renowned for its gluten-free and healthy properties which you can read more about here. Archaeological evidence actually suggests pancakes were eaten in prehistoric times. But our tastebuds have evolved since then. We crave dishes that are funky, tantalising, have personality and are diverse – and the crepe is all this and more. Pancakes, you can stay in the dark ages: it’s time for a crepe revolution! If you want to know more about why we serve the best pancakes in Sydney, discover the Four Frogs story here.